In the last year we have had much to be thankful for with Benji. Another year has passed with no heart issues. Praise the Lord for a wonderful year! Thank you Jesus for being faithful. While dealing with the insanity with a school system that we are frustrated with, we noticed that Benji was having a whole lot more sensory related behavior issues. He was being VERY whiny, sensory seeking, sleepy and not wanting to eat. The not wanting to eat, we contributed to his allergy medication. He takes flonase and if he takes it straight for more than two weeks his appetite wanes. That did not explain the rest though. Tuesday morning we made a sick visit appointment for Wednesday afternoon thinking we should get him checked before the holiday but not in a rush because there was no fever. Benji got to the doctor's office and was all over the place. In the exam room he was climbing and jumping and "crashing" and ... you get the picture. The doctor comes in and we go over everything. Benji had a low grade fever of 99.3, his ears and nose was clear and aside from a little irritation his mouth/throat was good too. Blood pressure was good (100/68) and even though he had a mucus-y cough his lungs were clear. So Dr. talked with me for a few minutes and I shared that in Kindergarten the "Slap Cheek Measles" was going around and so was Strep. Dr. didn't think it was strep but with Benji's aortic valve he figured best to check. Doctor - "Why do you think he is sick?" Mom - "He is out of control with his sensory issues." Doctor - (after getting test results back) "You might be on to something there." This has been a difficult school year. We thought we knew where everybody stood when it came to Benji's needs and his education. We may not have agreed with where they stood but we thought we knew where they stood. Over the weekend, I waited until Sunday afternoon to go through Benji's backpack from school. In an odd sense, I am glad I did. Benji's mid nine weeks progress report was in his folder.There were three things on the report that he did not know. The first I believe was just recently introduced so it is understandable as to why he has not mastered it yet. The second is a very difficult thing for a child that is VERY literal to grasp. The third would not have bothered me because he was only up to 29 on the report card, except that next to it was marked he could only count to 13. Many parents would think, well he just had a bad day, except 1) he has been counting to 20 for over a year if I remember correctly and 2) I was just told this past Thursday that he was doing excellent. I took the copy I made of his report card and a copy of the progress report to the school and spoke to the assistant principal about the situation. (He was in the meeting and heard the same wonderful news I had.) There were statements such as: kids aren't really consistent at that age, maybe it was a clerical error. There was the question of what I wanted them to do, also. This response infuriates me. 1) the OT sensory and hand writing... because Benji is no worse than the rest of the class he is in, he's okay. It doesn't matter that he has regressed. 2) on the report card it claims he has "mastered" a skill that 4 weeks later he can't do and it's "normal"
And how is this in the best interest of my child? How is it in the best interest of my child to be compared to students that have not had the same opportunities as him? How is it in the best interest of my child to say it's "okay" to regress? How is it in the best interest of my child to not care if he is actually doing well academically? We had the meeting about the OT services. I suppose a catch up is in order. We were notified 2 weeks ago that an evaluation had been done and that the school district wanted a meeting to discuss the findings. We had to reschedule due to conflicts but got it settled. Then on the 11th, we requested a copy of the evaluation so I could be familiar with it before the meeting. After a bit of communication I got my hands on it the 16th. As we had expected the school system's OT does not feel that Benji needs services at this time. In the meeting we were told that he shows NO signs of sensory integration disorder and that his fine motor skills in regard to his hands are fine and at peer level. Repeatedly Benji's ability was compared to class peer level. We are VERY disappointed that the school, teacher, therapist, etc... sees no problem with the regression that we see in both handwriting ability and his sensory related behaviors. We also do not understand how an OT evaluation can be done with only 15 minutes in the classroom and 20 minutes in the OT room. The OT person stated herself in past conversation that children with sensory issues don't always act the same continuously. Double Standard? I think so. As a side note... We know Benji is exceeding expectations considering he has Global Developmental Delay, Speech Apraxia, Sensory Integration Disorder, plus his medical issues including his CHD, hypoglycemia, food allergies and intolerances, and the hypotonia. For the most past he is on the appropriate level for a 5 1/2 year old. As his parents we see that there are areas he has regressed in and want him to get help. So, we just got a letter today requesting my presence at an M-team meeting in about 2 weeks to discuss "the educational needs" and to "review the results of your child's Occupational Therapy evaluation". What did I do? I sent an email to the principal at the end of September formally requesting the evaluation. I also spoke to a few people that I know in the school system casually. One of the people I talked to was the SLP that told me that she never received the "letter" from the main OT. As I have said from the get go with this, I just want the evaluation so we know what he needs. If he does not need assistance at school, fine. I know at home he has a VERY difficult time sitting still and focusing. Having just gotten his glasses it will take at least a week for him to adjust to see if that helps with anything. I knew something up was last week when he came home telling us that the woman wearing all yellow was asking him about his ABCs and numbers. Putting the pieces together, it was one of the therapists doing the OT evaluation. I ask for prayer. Please PRAY that what is best for Benji is what happens. If he needs the additional therapy, then we are praying he will get it. If he does not need therapy, then we pray that it is clear he does not need it. Tony Stark has nothing on Benji! 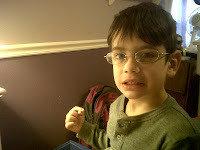 Glasses... and a Sensory Kid. Benji got to pick up his glasses yesterday from the eye doctor. He has been SO excited about them, it is really funny. His best bud at school wears glasses too along with having some medical issues, this just makes them even more alike. He is having adjustment issues. If you have ever needed to wear glasses, I am sure you can understand. Your eyes have to get used to the lenses. To explain this to a kiddo with sensory issues and that doesn't always get the easy things, can be tricky. So, we improvise. Benj, do you want to play video games? Then you have to wear your glasses. Dr. said so. So far, it's working. First day with them at school and both he and the glasses survived. What more can we ask for, right?